"We used Advanced Jury Research to mock try a large commercial case we were defending in Arizona. Jan Spaeth and her team did an outstanding job in connection with all aspects of the mock trial and preparing a very thorough report. She was professional, reasonable, effective and an absolute pleasure to work with, and we look forward to using her again." 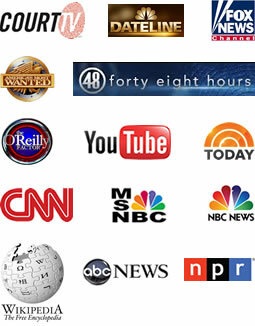 See our Clients & Feedback section for more comments. 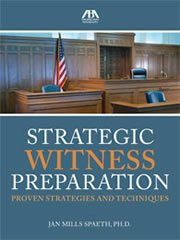 The American Bar Association has published Dr. Jan Spaeth's DVD set on Strategic Witness Preparation. This set offers 4.25 CLE credits for attorneys, and includes interviews with top consultants across the country. 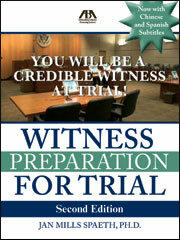 Dr. Spaeth and the American Bar Association have released the Second Edition of 2 DVDs on witness preparation to show clients & lay witnesses in preparation for their testimony. These now include subtitles in Spanish and Chinese. "Dr. Spaeth and the Advanced Jury Research staff proved to be an invaluable asset to our trial team during a high-profile murder trial of a police officer in Los Angeles, CA... In the face of intense political and racial issues, Dr. Spaeth's expertise led us to select a fair and impartial jury..."
AJR’s trial / jury consultants provide proven strategies and innovative solutions to assist with even the most challenging cases. We specialize in focus groups and mock trials, witness preparation, jury selection and case strategy. We also provide solid “reality checks.” For the past 30+ years, our extensive knowledge, expertise and cutting-edge research have led to successful results for trial teams. Our services meet the needs and budgets of our clients for depositions, settlements, plea bargains, or trials. Advanced Jury Research works statewide and nationally with a wide range of clients in both civil and criminal matters, including law firms, corporations, educational institutions, health care organizations, and government agencies. Contact us today to learn more about how we can help you achieve successful results! "Another monumental contributor to our cause was Jan Spaeth of Advanced Jury Research, Inc., who helped us in pre-trial research as well as guiding us with jury selection. Jan and her company could not have been more responsive to our needs or helpful to our outcome, and we would recommend her services to any attorney on any case. The ability to identify potential problem jurors is a prerequisite to success, and one will not find anyone more accomplished at that than Jan Spaeth." Dr. Spaeth presented a 1.5 hour CLE session entitled Prepping The Difficult Witness, for the American Society of Trial Consultants' annual convention in Seattle. Rosalind Greene presented a 1.5 CLE seminar at this conference entitled‚ Experienced Consultants Debate Hot Button Issues. Dr. Spaeth presented a 2.5 hour CLE on Preparing the Lay Witness for Testimony‚ for the Pima County Bar Association in Arizona. Dr. Spaeth presented a 1 hour CLE on Voir Dire and Jury Questionnaires‚ for the Tucson Defense Bar in Arizona. Dr. Jan Spaeth and Rosalind Greene, J.D., presented a 3 hour CLE seminar in Minneapolis titled‚ Critical Steps of Witness Preparation. Included was material from Dr. Spaeth's DVD set titled Strategic Witness Preparation, released by the American Bar Association. Rosalind Greene, J.D., also co-presented a 2.5 hour seminar‚ Mediation Skills Workshop, at the American Society of Trial Consultants' convention. This program emphasized techniques that enhance counsel‚ bargaining position in mediations and other methods of ADR, including the use of case strategy, witness preparation and focus group research.